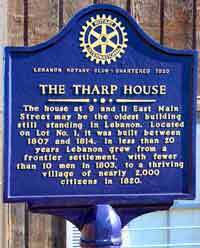 In downtown Lebanon, across the street from City Hall, is the Tharp House. It is an unassuming structure, obviously old, but doesn't look that old, at least in appearance. It has not been restored and it is in obvious need of repair. Next to the building is a historical marker telling that the structure is believed to be the oldest building still standing in Lebanon. 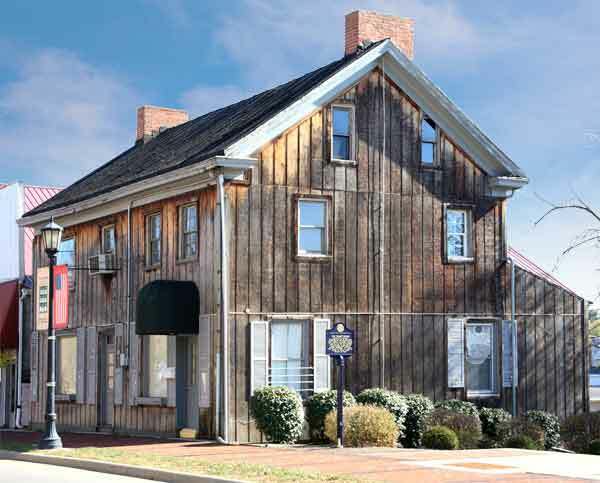 The house was built between 1807 and 1814, but more importantly it was home to John Tharp. Like many of Ohio's first settlers, John Tharp served in the Revolutionary War, and was present in some of Ohio's most historical events. John Tharp would be what we would call today as a military engineer. He knew how to skillfully work with his hands and could build fortifications quickly, with precision, and with materials readily available. Born in Somerset New Jersey in 1751, John Tharp was 25 years old when the Declaration of Independence was signed. At the outset of the war, John enlisted for 1 year of service. After taking a little time off after his initial enlistment, he entered service again for a 2 year enlistment as a Lieutenant. He was at Yorktown for the dramatic surrender of the British to General George Washington in 1781. After the Revolution, Tharp came west along with his new bride, down the Ohio River till he reached a small town called Losantiville. Here they decided to go no further and bought a lot in the small village. Later this little village would become Cincinnati. But for right now, Losantiville was on the extreme edge of the American frontier. It was here that John Tharp built his home. Problems were brewing on the western frontier between a small group of Native Americans and settlers who had moved further north of the Ohio River than was permitted under the existing treaties. Fearing that the British might take advantage of the turmoil between the Indians and settlers, the brand new federal government sent a military expedition to put an end to the fighting. This was led by Josiah Harmar. Harmar's first task was to construct a fort as a base of operations in Losantiville. Based on his previous fort building experience, Josiah Harmar wanted someone that understood the ins and outs of fort building, to be in charge of the construction and materials required to build the structure that could be trusted with their lives. John Tharp was the perfect candidate. When finished FORT WASHINGTON would be an imposing fortress situated along the Ohio River. However, no matter how strong the fort, it would prove useless in the fight against the Indians as Josiah Harmar advanced north far from this fort. Except for building the fort, Harmar's mission was a failure. He was forced to retreat. President Washington turned the task over to Northwest Territory Governor Arthur St. Clair who also used Fort Washington as a base against the Miami and Shawnee being led by Little Turtle and Blue Jacket. During this campaign, like Harmar, St. Clair was overwhelmed by his enemies and forced to retreat back to Fort Washington. John Tharp was there for this humiliating defeat. Several years later, President Washington asked his old friend, Anthony Wayne, to put together another expedition of trained military men, for a third try to quell the fighting on the western frontier. The now 42 year old Tharp was recruited to be in that force and took part in the Battle of Fallen Timbers and was present for the signing of the Treaty of Greene Ville the following year. Following the success of this campaign, Tharp bought some land along with his brother-in-law Silas Hurin, in what would later become Lebanon, not far from Cincinnati. It must have seemed like deja vu. He had just purchased a prime piece of property and built he dream home in what he thought would one day become a very important location not far from the Little Miami River. The urge to take up arms once again must have been strong when he read reports in the Western Star that the Indians and British were on the verge of invading Ohio at any moment. A call to arms had gone out through Ohio for all able bodied men to assemble and defend the state. At the age of 61, John Tharp joined the war effort, as did many Ohioans. Unfortunately for him, and 5000 other volunteers, their commander, when they came face-to-face with the British, gave up without a fight when they first encountered them at the little village of Detroit. Eventually, Tharp and most of the other prisoners of war were released. John Tharp returned home to Lebanon and died 7 years later. He is buried in Lebanon Cemetery.